Age spots, liver spots, or brown spots usually first appear on the face and are the result of genetic susceptibility as well as sun exposure. Contrary to common belief they have nothing to do with age or the liver although one may get more as they get older. In addition to the face, they often can occur on the chest, arms and any sun-exposed areas. Brown spots or age spots do not respond to creams. They can safely and effectively be removed by a variety of laser treatments. The most effective treatment for brown spots on the face is the use of Q-switched lasers such as the Q-switched Alexandrite laser or the Q switched Nd-YAG laser. Often, one treatment is enough to eradicate brown spots safely and effectively anywhere on the body. Rarely a second touch up treatment will be necessary. Freckles on the face, chest, and back can also be effectively treated with the Q-switched Alexandrite of Nd:YAG lasers. Intense pulsed light sources (IPL) or photofacials can also be used in treatment of brown spots or age spots. However, treatment with this modality often requires at least three to five sessions. This modality is not as effective as lasers. Fractional Resurfacing with the Fraxel laser is also an effective treatment for brown spots for those individuals who additionally seek improvement in fine and moderate wrinkles, texture, pores, acne scars, and other skin imperfections. 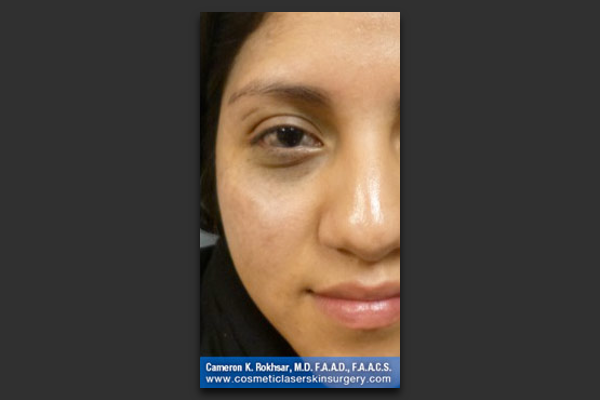 28 years old Hispanic female visited our office complaining of brown spots on her face since her birth (Nevus of ota). 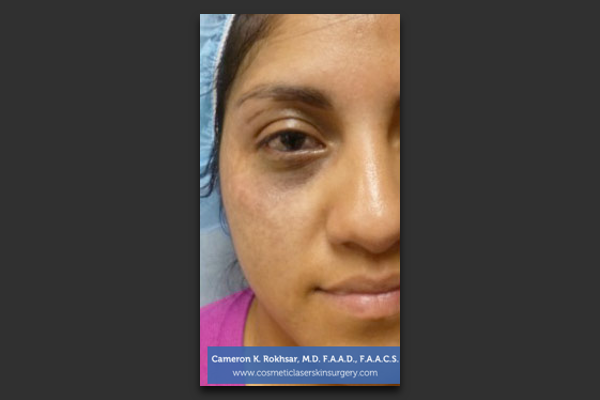 She was treated with Q-switched laser and results show complete resolution. Research shows that there are, in fact, two distinct types of aging. Aging caused by the genes we inherit is called intrinsic (internal) aging. The other type of aging is known as extrinsic (external) aging and is caused by environmental factors, such as exposure to the sun’s rays. Genes control how quickly the normal aging process unfolds. Some notice those first gray hairs in their 20s; others do not see graying until their 40s. People with Werner’s syndrome, a rare inherited condition that rapidly accelerates the normal aging process, usually appear elderly in their 30s. Their hair can gray and thin considerably in their teens. Cataracts may appear in their 20s. The average life expectancy for people with Werner’s syndrome is 46 years of age. The Sun. Without protection from the sun’s rays, just a few minutes of exposure each day over the years can cause noticeable changes to the skin. Freckles, age spots, spider veins on the face, rough and leathery skin, fine wrinkles that disappear when stretched, loose skin, a blotchy complexion, actinic keratoses (thick wart-like, rough, reddish patches of skin), and skin cancer can all be traced to sun exposure. Photoaging occurs over a period of years. With repeated exposure to the sun, the skin loses the ability to repair itself, and the damage accumulates. Scientific studies have shown that repeated ultraviolet (UV) exposure breaks down collagen and impairs the synthesis of new collagen. The sun also attacks our elastin. Sun-weakened skin ceases to spring back much earlier than skin protected from UV rays. Skin also becomes loose, wrinkled, and leathery much earlier with unprotected exposure to sunlight. Sun Spots, or Brown Spots, like their name implies, is a condition developed by overexposure to the sun. The darkened patches of skin can appear in a variety of shades depending on a patient’s skin type, age and amount of exposure. Also called actinic keratoses, liver spots or age spots can be mildly treated with strong topical medicine made with hydroquinone that works to bleach the spots and even out skin tone. Lasers have been proven to most effectively treat sunspots. Unfortunately, they cannot be completely erased, but laser treatment can stimulate new melanin production that will exfoliate the out layers of the skin, bringing sunspots to the surface where the skin can naturally shed the old skin. Q-Switched Alexandrite Laser– When the laser is shone on an area of skin, the irregular pigment absorbs the laser light. During absorption, the pigment is broken down and then shed by the body’s natural process. Q-Switched Ruby Laser– Uses a wavelength with a similar technique to absorb the melanin. The laser is highly selective in targeting the pigmented cells that cause a discolored appearance. Fading has been clinically proven and tested as a safe and effective procedure for removing sunspots. Nd:YAG Laser– Another Q-switched laser(https://cosmeticlaserskinsurgery.com/alexandrite-q-switched-laser/) that’s known for its efficacy in removing sunspots. After the laser has been placed over the discolored skin and treatment is complete, the pigment will develop a white color and leave behind a small scab. After the skin continues its natural healing process and the scabs fall off, a slight red discoloration will remain but slowly fade and new skin with matching pigmentation to the rest of the undamaged face will take its place. Can people with dark skin complexions get skin damage? Although people with medium or dark complexions naturally have more melanin (skin protection) than people with light complexions, they can still experience sun damage. Irregular pigmentation and wrinkles can appear with age and sun exposure. How can I tell the difference between age and liver spots from freckles? Age or liver spots usually develop in large numbers, especially soon after repeated sun exposure and develop more often in advancing age. Freckles usually develop earlier in life and appear as red or light brown.